Transport Located in elegant Mayfair, in the heart of London, The Sheraton Park Lane Hotel is London's finest monument to art deco style. Overlooking Green Park, the hotel is just a short stroll away from Buckingham Palace, the boutiques of Bond Street, Knightsbridge, and London's West End theatres. Also within walking distance are the National and National Portrait Galleries on the now pedestrianised Trafalgar Square. The shopping paradise of Oxford Street and Regent Street is a stone's throw away. Description The 305 well appointed bedrooms and suites are tastefully decorated with every modern amenity - ideal for the business or leisure traveller. Be sure to take a traditional full afternoon tea in the world famous Palm Court Lounge and savour the ambience, whilst being serenaded by the resident harpist. The relaxed and informal dining of the award-winning Citrus Restaurant, a favorite among all guests, features the finest in contemporary Mediterranean cuisine. Tastefully decorated and well appointed, each of our guest rooms and suites capture the essence of this art deco hotel's spirit. Many of the rooms feature stunning views over Green Park and retain many original features such as fireplaces and marble bathrooms. 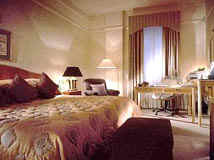 Other room facilities include television, safe, mini bar, bathrobes, hairdryers and 24-hour room service. The Palm Court, London's most prestigious lounge, offers everything from an informal lunch to a sumptuous English afternoon tea. 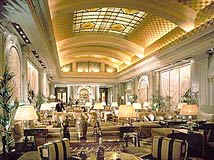 The beautiful art deco setting takes you back in time to a bygone era of style and elegance. Enjoy the finest contemporary Mediterranean cuisine and spectacular views of Green Park at the Citrus Restaurant. Specializing in pre- and post-theatre suppers, you can also dine al fresco during the summer months. Should you prefer to stay in, an in-room dining menu offers delicious options for room service. The art of relaxation takes on new meaning with Sheraton's in-room spa and salon service. Discover personal attention and therapeutic indulgence for mind, body, and soul without ever leaving the comfort of your room.The hotels' 24-hour fitness facility offers a variety of the latest cardiovascular equipment. 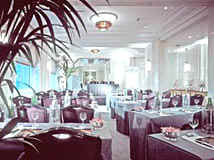 The hotel's 11,000 square foot ballroom complex provides the ideal setting for any special event. In addition, three state-of-the-art, contemporary Smart Meeting rooms can accommodate anywhere from eight to 22 people and all boast the latest in meeting technology - from audio visual conferencing ISDN lines and multi-system DVD player and VHS to rear projection screen and plasma TV, hand-held touch screen control system, and a Dolby Surround system. The largest meeting room seats 500pax. In the past, it has played host to many famous films and television programmes - from Jeeves and Wooster and Brideshead Revisited to James Bond's Goldeneye. 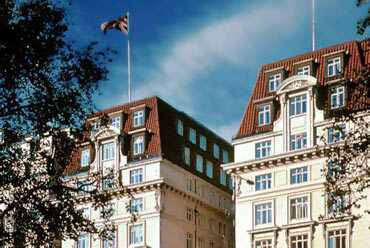 Our Comments We warmly recommend this stunning hotel in London's most prestigious address. Superb amenities and facilities for both the business and leisure traveller.